We bought the tools, we rented the space, and we created a place where people can come together and collaborate. Portland’s design scene is anchored by programs like Portland State University’s graphic design department and residents that embody the spirit of the entrepreneurial generation. (Read William Deresiewicz’s observations of the Millennial Generation based on his experience with today’s entrepreneurs in Portland.) 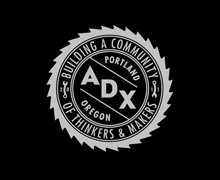 ADX (Art Design Portland) encourages the city’s already active scene of designers, thinkers, and makers to build a community and make things together. ADX creates opportunities for people to learn manufacturing skills with classes like Intro to Metal, and Woodworking Basics. Members take their ideas from sketch to product with ADX’s prototyping and fabrication equipment. The shared space encourages members to organically form partnerships and start businesses, and if a business needs some help to get off the ground, ADX provides business and marketing services. ADX’s partnerships extend beyond their own walls and into the city. This past February they took part in GOOD’s Ideas for Cities campaign, which “taps creative problem solvers to drive urban revitalization through the arts.” Team ADX partnered with the Lents neighborhood in SE Portland to nurture a stronger, more competitive business climate. You can read more about their proposal here. We think more cities need to adopt Portland’s supportive attitude for the arts, and institute spaces for innovation to thrive. We applaud ADX’s efforts and can’t wait to see the collaborations and products that emerge from its members. Check out ADX’s website to learn more about the members and the events.